Safe Gas And Plumbing Brighton are Gas Safe registered heating engineers who supply and install gas boilers. For similar replacement boiler companies in this area please visit the Hove boiler page. NEW 10 YEARS PARTS AND LAOUR WARRANTY ON WORCESTER BOSCH BOILERS FITTED BY US. We are established Brighton & Hove plumbers and heating engineers servicing throughout the whole of Brighton and the surrounding areas. Worcester Accredited and Gas Safe registered we are committed to our customer’s needs and will guarantee our standards for both service and workmanship to give you peace of mind. As an established company, we have the knowledge and expertise needed to ensure that you receive nothing but the best service. Our reputation has been developed through hard work and reliability which is why we are the area’s number one choice for plumbing & gas related work. Whether you are a private customer looking for a personal service or a Landlord looking for someone to look after your complete heating needs then Safe Gas & Plumbing can deliver what you need. 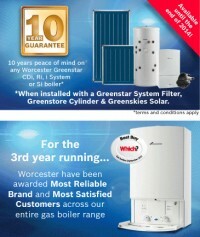 We are able to offer as standard 8 years warranty on Worcester boilers installed by us. I am the owner of the business, Mark Myers and take great pride in every job we take on.